Our drive to embrace innovative technology has won national recognition. 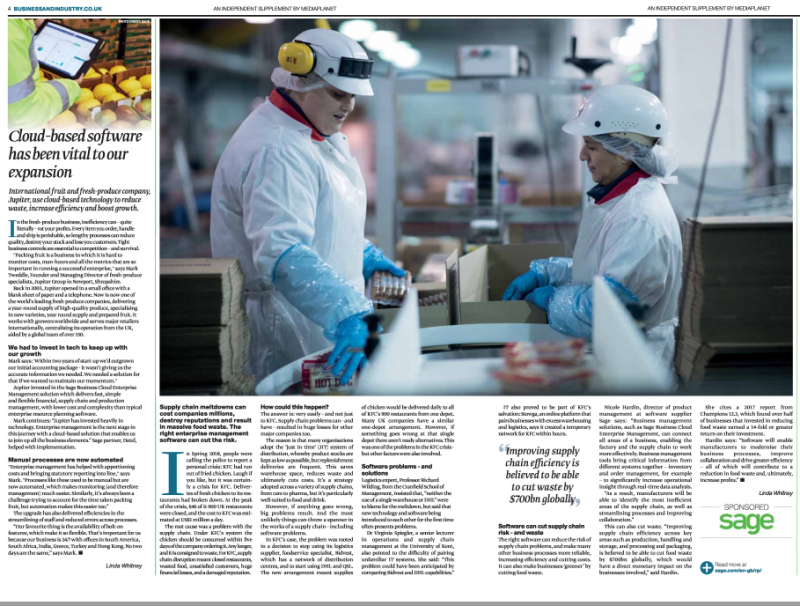 It comes after we were showcased in an impressive double page feature in November’s edition of the Industry Strategy magazine which is distributed within the Telegraph newspaper. The article, which also features on the Business and Industry website, focuses on our move to use cloud-based technology to reduce waste, improve efficiency, and boost growth. It states: “In the fresh-produce business, inefficiency can – quite literally – rot your profits. Tight business controls are essential to competition – and survival,” before chatting with our CEO Mark on our implementation of Sage’s Business Cloud Enterprise Management solution. In a nutshell, by delivering fast, simple, flexible financial, supply chain and production management, with lower cost and complexity than typical enterprise resource planning software, it’s allowed us to make impressive strides towards our long-term business goals. Mark reveals in the article that: “Jupiter has invested heavily in technology. “Enterprise management is the next stage in this journey with a cloud-based solution that enables us to join up all the business elements. “Jupiter is constantly changing and adapting and is consistently forward-thinking. Speaking of growing we’re continuing to build on our successes this year, which include ranking for the first time in the Sunday Times International Track 200 and being named the Best Fresh Produce Company in the UK by Lux Life. This includes significantly expanding our business in South Africa, which you can read more about here.